An 8th grader at Wheaton Christian Grammar School received a National Silver Medal for his writing piece for the Scholastic Art and Writing Competition and is one out of 100 students selected from Illinois to compete in the state Geography Bee on March 29, 2019. Wheaton Christian Grammar School 8th grader, Vander England was named a National Silver Medal winner in the Scholastic Art and Writing Competition as well as a semifinalist eligible to compete in the 2019 National Geographic GeoBee Illinois State Competition. 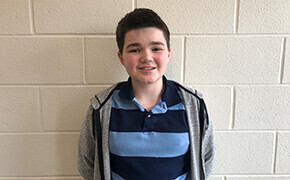 The National Silver Medal award was announced on March 13, 2019 and he was named a semifinalist in the Illinois State Geography Bee on March 4, 2019. Vander received a Gold Key regional award in February that made his piece eligible for national judging in New York City. His piece is in the humor category and is titled "A Modern Fable." You can read his National Silver Medal piece here. Beginning in 1923, the Scholastic Art and Writing Awards' mission is to "identify students with exceptional artistic and literary talent and present their remarkable work to the world through the Scholastic Art & Writing Awards." Students in grades 7–12 (ages 13 and up) from public, private, or home schools can apply in 29 categories of art and writing for their chance to earn scholarships and have their works exhibited and published. All across America, students submitted nearly 350,000 original works this year. There were four other WCGS students who received recognition and awards from the Scholastic Art and Writing Awards Competition in February. You can read about their achievements here. Vander will also be competing in the Illinois State Geography Bee on Friday, March 29, 2019. This is the second level of the National Geographic GeoBee competition, which is now in its 31st year. School GeoBees were held in schools with 4th through 8th grade students throughout the state to determine each school champion. School champions then took an online qualifying test, which they submitted to the National Geographic Society. Vander is one out of 100 students competing in the Illinois State GeoBee. Congratulations to Vander for all of his exciting achievements these past few weeks! We are excited to see how the Lord will use his skills and talents as he leaves WCGS in May and heads to high school.